Intervals is a flexible and customizable project management software platform, empowering you to personalize workflows and how it looks. Manage online projects, tasks, and time your way. 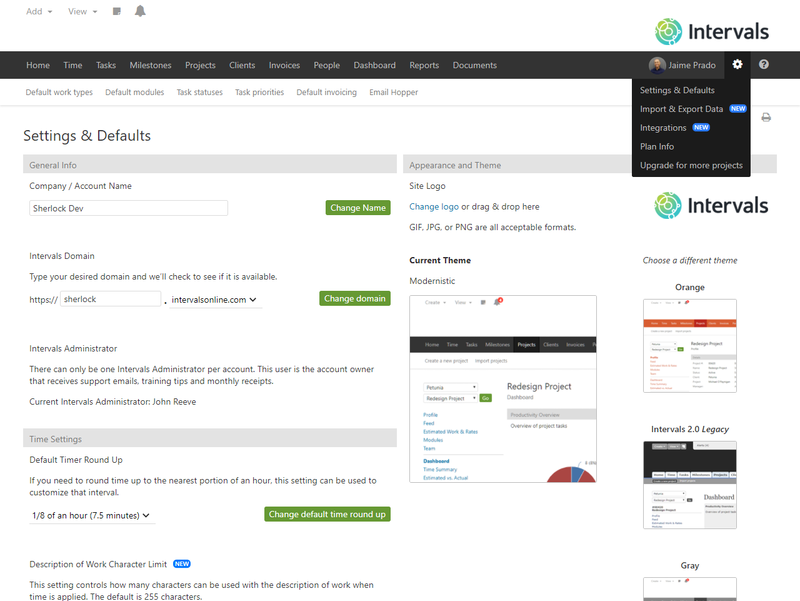 Change the default colors, upload your logo, set your default work types and hourly rates, and more. Not doing your work in the US? Intervals supports over 70 non US locales for currency and date/time formats. Doing work in the UK, Canada, Australia or Sweden? Simply change one site setting in Intervals. The interface is always in English with character support for all unicode characters, including Mandarin & Chinese. Need to get at your data and create custom reports or functionality? The API can be utilized to customize how you interact with your Intervals account. Intervals shows your team that you have an established process and a powerful way of doing work.